How beautiful is this wild spot, with its accompaniments of lawn and thicket, with its clear stream, now prattling over a rocky bed, and now dancing in playful eddies beside the tufts of grass and yellow flowers, that skirt the margin of the water! Innumerable boughs shut out the distant prospect, and neither a church-spire, nor curling smoke, ascending from some lone cottage, betoken the abode of men. 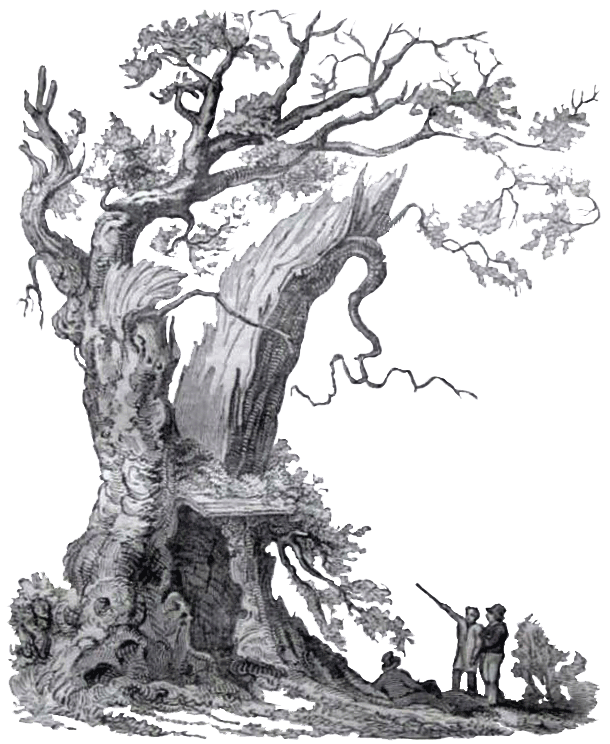 In the midst of this fair spot stands a “caverned, huge, and thunder-blasted oak;” its dry branches are white with age, the bark has long since fallen from them, and most impressive is the contrast which it presents to the lightness and the freshness of the young green trees among which it stands, as among them, though not of them. Beyond their verdurous circle are a variety of romantic dingles, covered with blackberry-bushes, with moss, and ivy. Gigantic trees fling the shadow of their noble branches over the green sward, and the spaces between them are filled, here, and there, with an exuberant growth of underwood. The music of almost every feathered songster that frequents the woods of England is heard in this wild spot; but except the buzzing of flies that rise in crowds from the copses, and the pleasant rippling of the stream, no other sound meets the ear. The old tree with its bleached and skeleton arms has a fearful name, and stout of heart must the man be who would pass within sight of it when the sun is set behind the hill, and the trees cast their lengthened shadows on the grass. 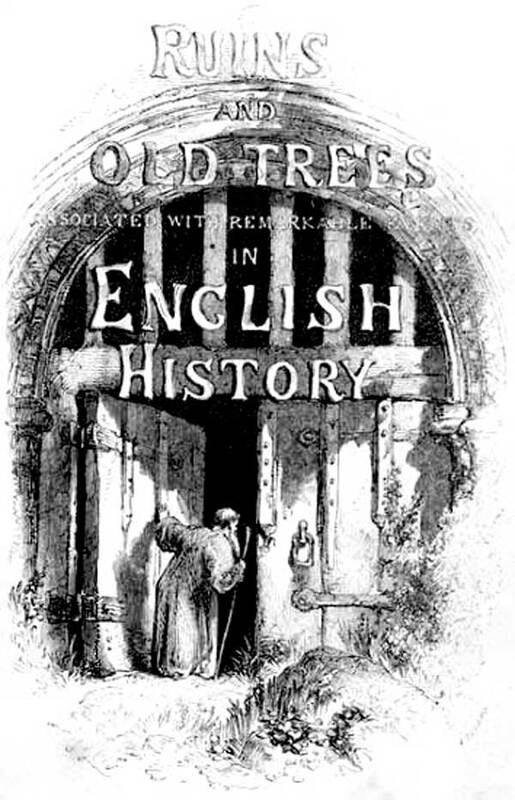 It is called the ‘haunted oak,’ the ‘spirit’s blasted tree,’ or the ‘hobgoblin’s hollow tree,’ and dismal is the tale to which the name refers. 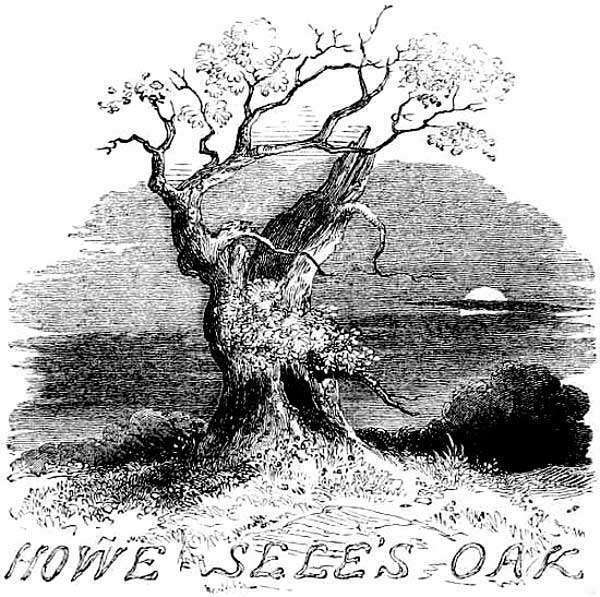 Howel Sele, whose sad history is associated with this blasted oak, was lord of the wide domain which extends around it for many miles. We know not whether his heart was secretly inclined to espouse the faction of Henry IV., or whether he loved a life of ease, and preferred to dwell in his castle-hall, hoping that the storm which threatened to overwhelm his country might pass away. Certain it is that Owen Glendour thought not well of him, and perhaps with reason. He came not forth to assist in delivering his country from the aggressions of a foreign enemy; some even said that he had been induced to desert her cause, and that he only waited for an opportunity to avow himself. Others, whispered, that he looked with a jealous eye on the generous Glendour; and that he feared not to speak of him as the sole leader of a desperate faction, who, if deprived of their head, had no other hope. Glendour knew that such evil rumours were abroad, and it seemed as if he wished to set his kinsman at defiance; for having taken with him his chosen companion Madog, he set forth to drive the red deer from the forest brake, in the domains of the unbending lord of Nannau. But the lord of Nannau could not brook that his red deer should be thus vexed and driven, and when one of these noble animals crossed his path, closely pursued by the fiery Glendour with hound and horn, he rushed from the forest and summoned his cousin to single combat. It was a fatal one for Howel; he fell on the green sward, in the very place where all is now so verdurous and joyful, and his corpse was dragged by his enraged kinsman beneath the tree, whose bare and sapless branches and high top, bald with dry antiquity, whose gnarled and rugged trunk, and large projecting roots are almost fearful in their decay. The tree was hollow at that time, and the companion of Glendour having, with his assistance, lifted the corpse of the unhappy chieftain from off the ground, dropped it within the oak. This was a ruthless deed, but the natural gentleness of Owen Glendour had been perverted by the scenes in which he mingled, and by the oppression that was exercised towards him. He saw only, in the husband and the father who had fallen by his hand, one, who, if he favoured not the cause of the usurper, was yet indifferent to the welfare of his country. He, therefore, sought not for him Christian burial, in consecrated ground. Glendour could no longer tarry in the domains of the murdered chieftain, for he knew how greatly Howel was beloved, and that when the hour of his return was passed, every glen and forest-path would be sought for him. Calling to his companion, he hastened back to his stronghold, Glyndwrdry, where, amid rocks and waterfalls, and the howling of fierce winds, he passed a few more unquiet years. The wretched day which caused him to become a murderer, and deprived Nannau of her lord, was one of anxiety and grief. Far and wide did his vassals haste, now down the glen, now in the depth of the still forest, now scouring over the wide moor, and now making every rock resound with his name. But in vain did they hurry along the forest paths, or dash amid the torrent’s roar, or scour over the wide moor, echo alone answered to their loud shouts. In vain did the sorrowing wife of Howel look out through the gloom of evening, and listen for his footsteps; and when the moon shone bright, and louder sounded the wild torrent, and the whoop of the owl was heard, did she pace her lonely chamber and strain her sight through the gathered mist, to see if he was coming. The next day, and the next, did the vassals of Nannau renew their search. Again every glen was visited, and every forest-walk was traced and retraced; the base, too, of every hill was carefully examined, lest the chieftain should have fallen from some height, which the creeping bramble and thickly-tangled underwood had concealed. But no trace of Howel was discovered. Thus one year succeeded to another, and no tidings of the chieftain were received, till at length an armed horseman was seen to urge his weary steed up the hill that leads to Nannau, from the neighbouring town of Dolgelly. The rain fell fast, and the wind blew a perfect hurricane, but he seemed not to heed either the one or the other, or to spare the horse on which he rode. The vassals hastened to the castle-gate, and the lady looked anxiously from the window. Perhaps a faint hope flashed across her mind that the Lord of Nannau was returning. But it was not him, although the stranger brought tidings where he might be found. He told the lady that the enemy of her house was dead; that he in dying, had conjured him to bring to her ear tidings of her husband, and to make known the dreadful mystery of his sudden disappearance. He then told his tale; for it was Madoc, who came thus late, and he referred to the blasted oak in confirmation of the truth. The vassals of Nannau hurried thither, and with them went Madoc, but he could not bear to see the bringing forth of him, whom he had helped to sepulchre within its trunk; he shrunk from witnessing the awful sight that was about to be revealed, and plunging into the forest was soon on the road to Dolgelly. The evening was far advanced when Madoc reached the castle, and now the night had closed in. The vassals worked by torch-light, for such was the lady’s command, and their own eagerness confirmed it. Their strokes fell heavy on the trunk of the tree, which sounded hollow, and somewhat of a rattling was heard within, as if of iron and of bones. Some feared to continue, and truly it was solemn work, for the night was dark, and the wind exceeding loud, and the tree stood forth in its sepulchral whiteness, with its long skeleton-looking and bleached arms, which the lightning had riven. A few strokes more, and the horrid mystery’ was revealed. There stood the skeleton of Howell; his right hand grasped a rusty sword, and those who saw it, well remembered that it had often been wielded by their chieftain.